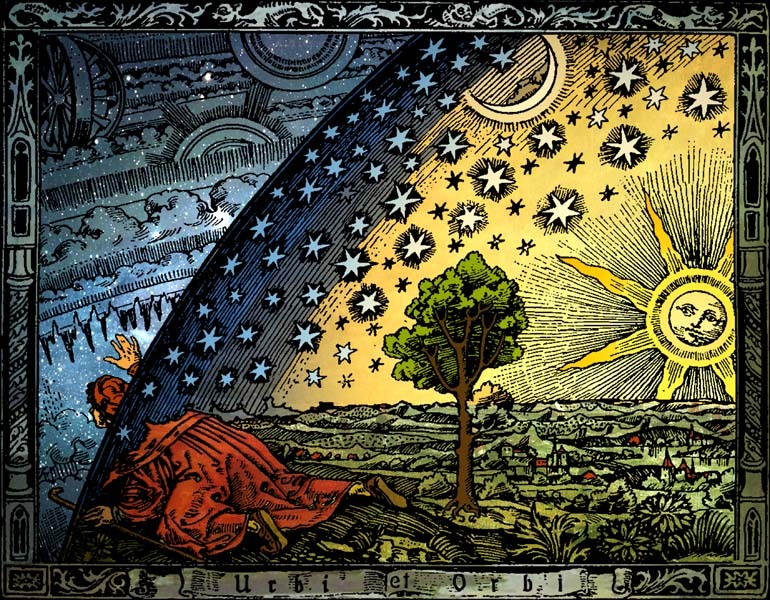 Universum – Flammarion woodcut, Paris 1888, colored by Heikenwaelder Hugo, Wien 1998. Original for Flammarion’s 1888 L’atmosphère : météorologie populaire (p. 163). All due thanks to Wikimedia Commons. The image is described, in my brutal translation, as “A missionary of the middle ages tells that he has found the place where Heaven and earth meet”. If so, I am convinced, it was somewhere near Hay, in fact I think I know where. About 8 miles from here is Capel-Y-Ffin where the artist Eric Gill and his followers lived in some notoriety in the former monastery in the 1920’s. It was here that he designed the Gill Sans typeface which I use a lot. Capel-Y-Ffin was described by a Victorian clergyman who lived there as a place where the boundary between the two worlds was “Thin”. There is definitely a splendid feeling of calm and grace about the church when you visit.